No 1 in Italia.Our classic ricotta is a smooth soft cheese made from cow's milk whey and milk cream, with a moreish fresh flavour, grainy texture and sweet tang. Blend basil and fresh spinach with our ricotta and serve in a lasagne twisted the Italian way, for an easy & comforting dinner at home. Made from the whey, milk cream and whey cream from pasteurised cow's milk and acidity regulators. Not suitable for vegetarians. 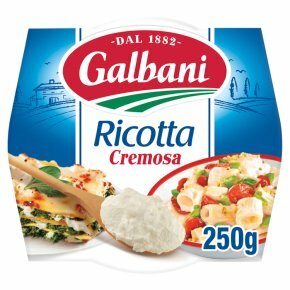 Galbani is Italy's favourite cheese producer, crafting many of Italy's most loved cheeses since 1882. Bruschetta with veggies Ingredients for 4 people 250 g of Galbani Ricotta 8 slices of wholemeal bread 8 cherry tomatoes 6 courgettes 4 teaspoons of extra virgin olive oil 1 tablespoon of chopped parsley 1 clove of garlic Salt and freshly ground black pepper to season Preparation Pre-heat the oven to 180°C. Rinse the courgettes, cut one into thin slices and chop the other five into small cubes. Cut the cherry tomatoes in half and sprinkle them with a little salt. Gently fry the garlic in the olive oil then add the diced courgettes with a bit of salt, pepper and the finely chopped parsley, then cook on low flame for 15 minutes. When cooked stir in half of the Ricotta and mix it until creamy. Place the sliced courgette and the bread on the baking tray and grill in the oven. Spread the courgette and Ricotta mix on the bread slices, season with salt and pepper, top with a slice of the grilled courgette and some chopped cherry tomatoes. Serve warm.